** Under certain conditions of pressure and temperature, most substances can exist in any one of three states of matter: solid, liquid, or gas. Water, for example, can be solid ice, liquid water, steam, or water vapor. The physical properties of a substance often depend on its state. ** Gases, are simpler than liquids and solids in many ways. ** Molecular motion in gases is totally random, and the forces of attraction between gas molecules are so small that each molecule moves freely and essentially independently of other molecules. Subjected to changes in temperature and pressure, it is easier to predict the behavior of gases. ** The laws that govern this behavior have played an important role in the development of the atomic theory of matter and the kinetic molecular theory of gases. ** A gas is a substance that is normally in the gaseous state at ordinary temperatures and pressures; a vapor is the gaseous form of any substance that is a liquid or a solid at normal temperatures and pressures. Thus, at 25oC and 1 atm pressure, we speak of water vapor and oxygen gas. ** We live at the bottom of an ocean of air whose composition by volume is roughly 78 percent N2 , 21 percent O2 , and 1 percent other gases, including CO2 . Today, the chemistry of this vital mixture of gases has become a source of great interest because of the detrimental effects of environmental pollution. ** Here we will focus generally on the behavior of substances that exist as gases under normal atmospheric conditions, which are defined as 25o C and 1 atmosphere (atm) pressure. ** The following Figure shows the elements that are gases under normal atmospheric conditions. (1) Hydrogen, nitrogen, oxygen, fluorine, and chlorine exist as gaseous diatomic molecules: H2 , N2 , O2 , F2 , and Cl2 . (2) An allotrope of oxygen, ozone (O3), is also a gas at room temperature. (3) All the elements in Group 8A, the noble gases, are monatomic gases: He, Ne, Ar, Kr, Xe, and Rn. apply a large amount of energy, which in practice means strongly heating the solid. temperature to well above 1000°C. (5) The behavior of molecular compounds is more varied. Some for example, CO, CO2 , HCl, NH3 , and CH4 (methane) are gases, but the majority of molecular compounds are liquids or solids at room temperature. However, on heating they are converted to gases much more easily than ionic compounds. In other words, molecular compounds usually boil at much lower temperatures than ionic compounds do. There is no simple rule to help us determine whether a certain molecular compound is a gas under normal atmospheric conditions. To make such a determination we need to understand the nature and magnitude of the attractive forces among the molecules, called intermolecular forces. In general, the stronger these attractions, the less likely a compound can exist as a gas at ordinary temperatures. 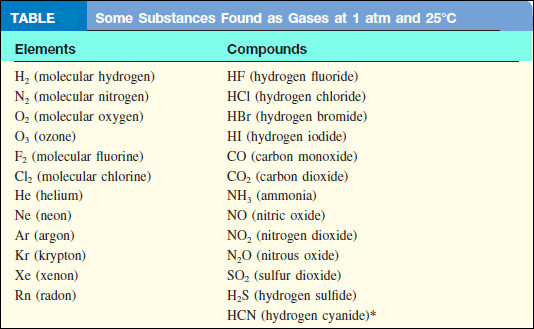 (6) Of the gases listed In the following the table ,only O2 is essential for our survival. Hydrogen sulfide (H2S) and hydrogen cyanide (HCN) are deadly poisons. Several others, such as CO, NO2 , O3 , and SO2 , are somewhat less toxic. 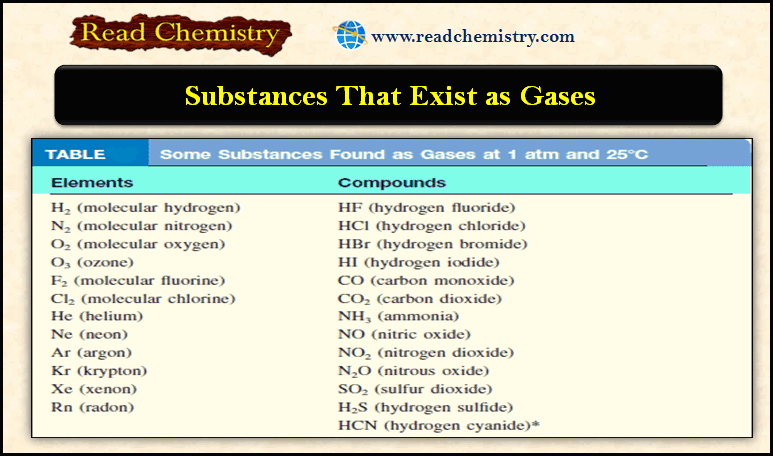 The gases He, Ne, and Ar are chemically inert; that is, they do not react with any other substance. Most gases are colorless. Exceptions are F2 , Cl2 , and NO2 . The dark-brown color of NO2 is sometimes visible in polluted air. (a) Gases assume the volume and shape of their containers. (b) Gases are the most compressible of the states of matter. (c) Gases will mix evenly and completely when confined to the same container. (d) Gases have much lower densities than liquids and solids. Reference: Chemistry / Raymond Chang ,Williams College /(10th edition).